The cloud storage services –is nothing but a web service application programming interface used to store, save, computing, and in business a high IO block storage, networking, database, high-throughput object storage, and much more. Here you can access, use your stored files across multiple devices, whether you're at home, work or on the go. One of the best options to share and store your files and documents on the Cloud, the Cloud Storage services should be the best you can opt for a number of reasons. There is no need to waste storage space on your system or mobile phone when you can easily store and save all your documents, media files in the cloud and even more, you can share it anytime across the different systems. Cloud storage can also help you in backing up your data just in case you have valuable data stored on your computer. In any case, ensure that you everything well synchronized, because most of the services tend to delete the files from the cloud as well when they are deleted from your local machine. Cloud computing services allow you to use a variety of benefits & features that make it a working strategy to fight against data storage challenges. Cloud maintains all the files & info in one location, thus with cloud backup options enabling you to access them through a co-located storage space from any device. There is a number of options available in the market for cloud storage services according to the business and as per the use of various customers. I have analyzed different cloud storage services that will help you choose the best cloud storage service for your backup solutions, so lets dive deep down to find more about them. Well, we are already aware of the importance that the cloud services carry in our day to day life. But, which one should you go with? Given a huge number of Cloud Storage services available for us, it may not be easy to pinpoint the best among them and choose the one that indeed meets your requirements. pCloud is a relatively new but very fast-growing cloud storage service. They were founded in 2013 in Switzerland and in only 6 years they now have over 9 million users across the globe. 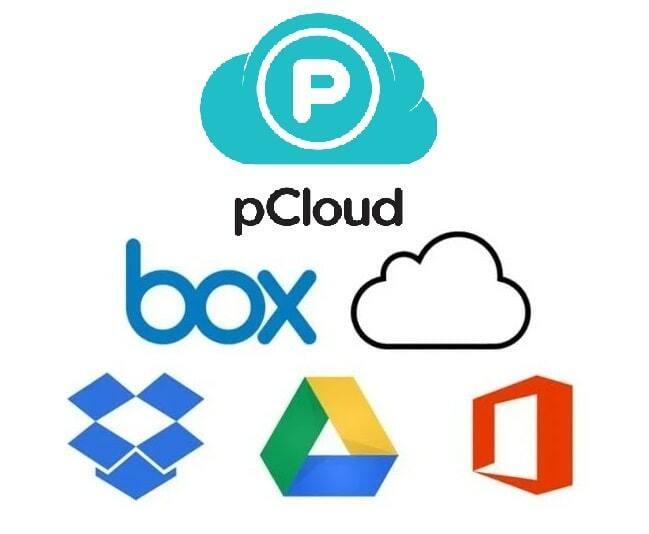 What makes pCloud one of the best cloud storage services is that their desktop app pCloud Drive does not use the storage of your computer by default. For example, my MacBook has 512 GB of storage with pCloud Drive I virtually add 2 TB of storage making the storage of my Mac at a total of 2.5 TB. Basically, the files that I keep in pCloud do not use the storage of my device but I can edit, share and work with them as if they are stored locally. Dropbox recently rolled out a similar feature called Smart-Sync but it’s currently only available to Business users. pCloud gives theirs to everyone, and absolutely for FREE. All you need to do is to drag-and-drop a file in pCloud Drive and when it’s uploaded to the cloud you can delete that file from your computer. After that, you don’t need to download it or anything to use it. You can open it at any time and it will be there but without taking any physical space on your machine. So yeah — pCloud Drive adds storage to your computer and acts as a virtual hard drive. Of course, those files are accessible on any other device you own via pCloud’s mobile apps and via the web (they have a browser version too). Speaking of mobile apps, here’s a feature I just love. It’s called “Free up storage”. After you turn on your Automatic upload which uploads all the previous or future photos and videos on your phone, you can delete all the files that are already in the cloud with just 1 tap. So no more low memory on your mobile devices too. You can share files and folders with people like all other cloud storage services. You can add passwords and expiration dates to your links. And you also have stats how much traffic and how many people have downloaded from those links which are also very cool if you’re sharing a lot and want to keep track. Also if you accidentally delete a file you can recover it for up to 180 days with pCloud Rewind. Some other cool stuff they have is the music player where you can create playlists and sort your music with various filters. pCloud has this paid feature called pCloud Crypto which is a client-side encryption add-on. What this means is that whatever you put in your pCloud Crypto folder, gets encrypted on your device and they store only the encrypted files. This means that nobody but you knows what is in that folder. This is great for keeping private information, passwords or any kind of important documents. pCloud challenged hackers from around the world to try and hack it for $100,000 and nobody could do it. We are talking about Cloud Storage and how can we leave aside to Google? Now that almost all of us are using GSuite and Google services in our day to day life, you would find Google Drive to be one of the prominent choices in the Cloud Storage arena. It comes integrated with your Google account and also on your Android device. The generous amount of storage space of 15 GB per user for free is what would make it a natural choice for most of us. There are a host of other advantages of using Google Drive as well. It syncs with the companion app Google Photos so that you can back up your photos and videos to the storage quite easily. What's more, if you are syncing your photos to Google Drive from Google Photos in high definition, it won't be counted against your Google Drive storage. The files, documents and other data shared by other users with you will not count against your Google drive storage. The interface is quite simple and easy to work with. You may also include a sync client on your desktop to share your files and documents with your Google Drive account. You can share your folders and files with other Google users either through the email link or a public link. You can add attributes like read-only to the documents you share so that no one would be able to make any changes to the document. The mobile apps available for Android and iOS ecosystems let you opt for selective sync. This will help you chose the specific folders and files on each of the devices. You can opt for versioning and real-time collaboration through Google Docs app. A considerably generous amount of storage for the free plan. Seamless integration across multiple Google services. Complete integration with the Android ecosystem. The web interface may be a little difficult to handle. Opts for AES 128 encryption compared to the competitors which adopt 256-bit encryption. If you are on Linux or Blackberry, you would be glad to know that Dropbox offers services across these platforms as well in addition to the other regular options like Windows, iOS, and Android. However, the free basic service comes with just 2 GB of storage space. However, unlike the other cloud storage services – Dropbox lets you EARN your additional storage by participating in a host of promotions. Some of the options you would be able to increase the storage to up to 16 GB can be linking your Dropbox account with your social profiles and inviting friends to join Dropbox. One of the most advantageous features that the tool offers include business collaboration options included within the package. Please note that these features would be available only under the business plans which are priced slightly expensive. For the desktop version, it creates a local folder with the files you want to add to your Dropbox storage and then syncs this folder online. That way, you would have access to your content whether you are online or offline. However, on mobile devices, it syncs directly online without storing the data in a localized folder. The included security features include a two-step authorization and an AES 256 bit encryption. You also have SSL encryption applied to the data being uploaded or downloaded. It should indeed be the prime choice for all your Cloud storage requirements. Though it does not come with a few fancy features that the competitors offer, still offers a solid platform for all your cloud storage tasks. Business features like collaboration included. You can increase the storage limits for free. High-end integration with Microsoft office online. Excellent Cloud-based service with a few business features packed in, it has been pushing its business plans quite aggressively. As soon as you go to the sign-up page, you would end up to the pricing page. You have access to 10 GB of free storage in the basic plan. Not to be confused with Dropbox, it started its operations in 2005. Primarily designed to be a business-oriented service, it also has personal storage options as well. One of the drawbacks could be the file size limitation of 250 MB per file for the free storage option. You have smartphone applications for almost all major mobile platforms including Android, iOS and Windows Phone. The cloud storage service also packs in a good sync companion for your desktop so that you would be able to upload your files with ease. The business plans come with advanced business collaboration options and tools along with an unlimited storage option. The free personal account does not offer versioning though. It can be one of the major concerns for the Box users apart from the issues faced with respect to the file size limit on the free account. From a functional point of view, it would be considered to be quite an excellent option. You have access to mobile apps across multiple platforms and can be assured of a slicker and fluid interface. It multiple options for editing, creating and uploading your files with ease. If you are looking to create documents, you can do so very easily on web portal using any of the options among Microsoft office, Google Docs or any similar options. What we loved the most with the option of Box is that it lets you link seamlessly with a host of apps and suites related to your business requirements. It is supported by a host of business applications including Google Docs and Office 365. We would consider a great option for all your needs in storage requirements, especially if you are an enterprise customer. It offers you a host of extra features making it one of the prime choices in its own right. The service is quite faster and enterprise-oriented. The experience of over 10 years speaks for itself. Lack of a few features in the free plan can be a concern – since these features are offered in the free option by other players. Deep integration with almost all major apps in the business realm. Business plans offer you a host of advanced features. Limited storage space in the free plan. File upload limit of just 250 MB per file. Like Google Drive, here is another excellent offering from another software giant. One drive is the ultimate cloud solution from Microsoft and offers you an excellent solution and functionality in tune with the other capable offerings outlined in this compilation. Obvious cloud storage for those on Windows 10 as it comes preinstalled with the operating system, the basic free option offers you just around 5 Gb of free storage. Known earlier as SkyDrive, it should be one of the best options to work with if you have just jumped into the new operating system. The cloud service application can also seamlessly sync with the Photos app on your Windows ecosystem letting you sync you’re your photos online. You can make use of specialized apps for Android and iOS users. In fact, there is an app for Mac users as well. Like Dropbox, it offers you the options of increasing your cloud storage limits by completing a few tasks like inviting and referring friends. It lets you share your files with either registered users or the non-registered ones through the use of a public link. If you do not want your contacts to edit the documents or files, you can limit them using attributes like reading only or similar other options. One of the features we liked the most with the tool is its interface that is modern enough for every aspect. You would be able to create folders and files with ease on the web. In fact, it supports Office and OneNote formats because of complete integration with the Microsoft ecosystem. However, recent updates to Windows 10 have introduced selective sync option. This is done by saving the space on your laptop or PC. Sharing your documents and files would not be an issue as such whether with the other OneDrive users or as a public link for the other users. You can also assign different attributes depending upon whether you would want the recipients to edit the document or only view it. Even when you are using a free version, you would be able to make use of these features. It also lets you integrate and link your major social platforms with your OneDrive account. Though it may not be a business feature, it would help you share your documents within your social circles. Moreover, if you have your files saved on another device, you can make use of the remote access feature on OneDrive to access them through the OneDrive website. In essence, it makes sense to opt for the free plan if you are using Windows services. Complete integration with Windows 10 ecosystem. Integration with a host of social media profiles. One of the best options if your major concern is privacy and security, Mega Cloud storage would be the best you can opt for. Launched back in 2013, it offers you a whopping 50 GB of storage with the free plan. It focusses on the security functions more than the rest of the aspects. An excellent free plan with the extremely generous storage space and an easy to use interface are what would make it an excellent option in its own right. The drag and drop functionality would make it an excellent cloud storage app. You can use it for uploading photos, videos, and all your favorite files and documents. You get a high degree of encryption all along the route. Your data is encrypted at the local level, en route to the destination and at the destination itself. Mega provides its services across multiple platforms like iOS, Android, Windows Phone and Blackberry. They also have local clients for Windows, Lux, and Mac. It also offers plugins for Chrome and Firefox. Sharing your files and folders with your clients is much easy and simple to follow. You can share the links to your documents through email or as a public link. The functionality is completely similar to that on Google Drive and OneDrive. You can configure your own level of actions like a view, edit or read-only. If you are sending those documents to those users who are not using Mega, you will need to send an encryption key to ensure that they can view it. Mega Cloud Storage is so confident of their services and the secure credentials that they have released the source code to the sync client so that the experts can check it for any kind of vulnerability or leaks. In addition to the Cloud Storage functionality, it also comes with a few extra communication features that include video communication, voice calls and Instant messaging. These services are encrypted end to end. This would make them one of the best options compared to other alternatives like Hangouts or Skype. Faster, secure and a cross-platform functionality are what would essentially make it one of the best options for your cloud storage requirements. In fact, security is one of the excellent features that would make it an extremely useful storage solution if your documents demand security features above the rest. A simple to use User Interface. An excellent free plan with a generous storage space of up to 50 GB. This is yet another option in your search for privacy in terms of a Cloud Storage, nothing can beat SpiderOak. While most of the cloud service providers in this compilation focus on encrypting your data, SpiderOak opts for a Zero Knowledge Privacy. SpiderOak is indeed a trendsetter when it comes to cloud storage providers. The service has it on the website and states that once you install the app on your device, all your data is completely encrypted even before it is synced. However, the source code is not available in the public domain and as such, it may not be feasible to ascertain whether this is confirmed. It features apps Android and iOS, while there are clients available for Windows and Linux. The apps on Android and iOS are only for viewing your files. You would not be able to upload or sync any data. You are allowed to log in via the web portal, but if you are someone who takes privacy quite seriously, you can avoid doing it as the encryption information would be exposed to the employees. Under other conditions, you can be assured of complete data security as the data you have stored on your cloud service would not be available to anyone else including the employees. In fact, even the government agencies will not be able to peek into your data as the encryption key is locally stored on your machine. The focus on the security features makes it a little or too obsessed with the criterion. This is the reason why there are no office styled apps or other app synchronization options. Sharing your files and documents with your colleagues and other collaborators a little difficult. In fact, that would bring us to explain the lack of collaboration and similar other options on the tool. Moreover, enhanced focus on the security and privacy features would make it even more difficult to have access to your files on multiple devices. The security functionality and the focus on it would be evident all through the system as you would notice it as you keep using it. You face warnings for every one of your actions if they tend to be a threat to privacy and security. For instance, if you leave the app logged in all the time, you will be warned of the consequences of the privacy concerns. The basic free account will come with a 2 GB storage option, which is quite paltry when compared to the most other competitors here. Moreover, this storage comes with an expiration of 60 days unless you upgrade to Pro version. A good number of native clients and apps for multiple platforms. The free offering comes with limited functionality. Well, Cloud Storage services tend to be quite practical for most of the purposes. They help you safeguard your data in the face of the calamities that may make the data inaccessible on your physical devices, or for sharing them with your friends, family or colleagues. They would also help you keep your files and documents in sync across multiple devices so that you would be able to access multiple devices. Free storage available should be one of the best options and all the services that we have included in this compilation come with free storage options. Of course, the degree would vary in a considerable manner. You can go for the premium offerings to get more storage, but the free storage available on each of these systems would offer you enough for most of your requirements. Which among the above did you find more useful and practical for a day to day usage? Do share your thoughts and inputs with us.